These are some apps that Mr. Carey uses frequently in class and at home for his own private use. Try some out if you're looking for new games and helpful apps! Tuning, volume, articulation, release, duration, and steadiness are the key elements of developing a beautiful tone quality. TonalEnergy Tuner is the first multi-purpose application that allows users of all ages to understand and improve every aspect of their sound. If you're going to buy just one app, this is the one to get. Subdivide is my go to metronome app. It has all the functions that you could need. Metronomes help keep a steady pulse and is a tool every musician should be using when they practice. Tempo is another fantastic metronome app. 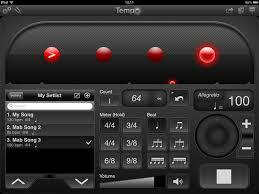 It is touted as the most popular metronome app in the app store. Great app. Simple, fun, addictive game! You'll hear a pair of pitches. Choose whether the second is higher or lower than the first. Great for training your ear how to listen for tuning and different pitches!